But the owner of a New Zealand gun store chain says the University of Otago professor is scaremongering, and the weapons, which can feature unlimited magazine sizes and require a special licence endorsement, are used largely by responsible pest controllers and sports shooters. 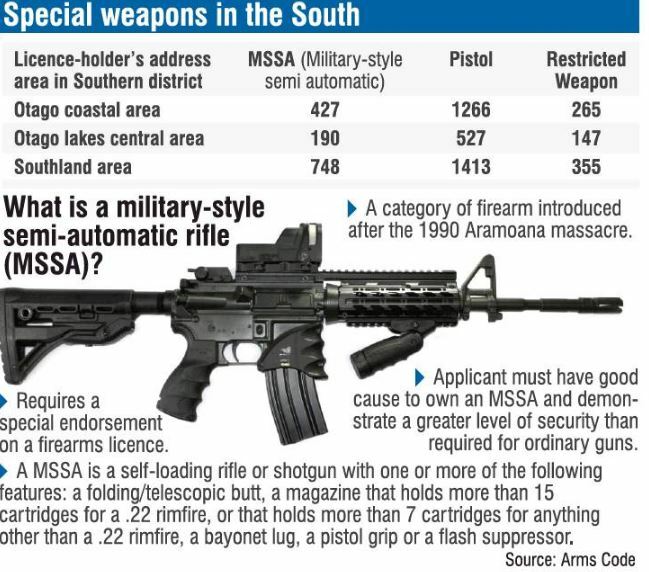 At least 1365 firearms licence holders are endorsed for military-style semi-automatics (MSSAs) in Otago and Southland, the equivalent of 41 per 10,000 people, according to figures released by police under the Official Information Act. Only Tasman (42 per 10,000 people) and Northland (43 per 10,000 people) have higher proportions of MSSA owners. The figure is 23 per 10,000 people for both Auckland and Wellington. The figures also show 3205 licence-holders in the Southern district (Otago and Southland) hold the endorsement required to own target pistols, along with 767 people endorsed to own "restricted weapons", including machineguns, grenades and rocket launchers. However, the Arms Act requires restricted weapons to be stored in an inoperable condition and never used with live ammunition — they are generally the domain of collectors, movie-makers and re-enactors. University of Otago National Centre for Peace and Conflict Studies chairman Prof Kevin Clements said he was astonished and concerned at the rate of ownership of MSSAs in the South, along with the numbers of pistols and restricted weapons. In his view, MSSAs such as AR-15 rifles were not required for hunting or farm work, and he feared they and target pistols could fall into the hands of criminals. "They’re clearly highly desirable for criminal activity ... and they’re highly lethal for anyone that has a psychotic break and wants to shoot large numbers of people." He was concerned about the possibility of bump stocks being added to MSSAs, turning them into fully automatic weapons. Bump stocks began figuring prominently in the gun control debate after they were used by Stephen Paddock, who shot dead 59 people at a music festival in Las Vegas in 2017. A special permit is required to import the accessory into New Zealand, but police have rejected at least two attempts to import bump stocks in recent years, and they do not appear to be available for sale in the country at present. Prof Clements called for New Zealand to follow the lead of Australia, where the Government ran a national firearms amnesty in 2017 after the siege in Sydney’s Martin Pl and the shooting of a police civilian amid concerns over the growing number of unregistered guns. He believed every weapon in New Zealand should be registered to its owner, Prof Clements said. Acting Superintendent Mike McIlraith said there were 66,085 MSSAs, pistols and restricted weapons linked to active firearms licence holders nationally. Gun City owner David Tipple, of Christchurch, said it was unsurprising the South had a relatively high rate of ownership of MSSAs given the use of large-capacity 30-shot magazines for pest control, especially by shooters operating from helicopters. "It was always intended in the legislation that we’d be protecting our national parks by the ability to control pests with a larger-capacity magazine." His chain of gun stores sells AR-15-style rifles, which have been used in several mass shootings in the United States, but he believed they had been unfairly vilified. "Is an AR-15 evil because you dislike the look of it? Do mag wheels make a driver more likely to break the law?" Mr Tipple said bump stocks were technically legal, but unavailable in New Zealand as police would not grant import permits. However, the reduction in accuracy from firing a rifle in automatic mode meant there was no demand for bump stocks, he said. "Nobody wants it ... We’re actually safer if everybody fits a bump stock, because they ain’t going to hit us." Typical university thinking, so how about registering knives and forks to their owners, they can be used as weapons too. I fail to understand why academic boffins get their opinions taken seriously outside of their classrooms. Statistically there are virtually no gun crimes committed by holders of endorsed firearms licenses. Gun crimes are committed by criminals that do not have firearms licences at all but have illegal access to firearms. Increasing the bureaucratic demands and compliance efforts on law-abiding citizens is a solution often proposed by academics to all the problems of society. Decreasing the bureaucratic demands police must observe to get criminals out of society would have a far more profound impact on public safety. One of the biggest needs in our society is for our politicians and judiciary to keep criminals out of our society once the police have identified and apprehended them. An equally large need in society is for a public health system that identifies and assists the mentally ill. If people whose mental state is a danger to themselves and others were identified and assisted, many problems in society would be reduced. It is accepted that mental illness is prevalent in those that use military assault rifles, or anti personnel ordnance, unload by discharging, or fire reflexively without identifying target. The problem in the South is private armouries, which are raided, or accessed by 'friends' on a revenge high, as reported in News. I think they have sussed that regulation is necessary. For that, of course, they are dissed by the gun lobby. Just wondering, how many moons does your planet have? Because none of your three blanket statements have any grounding in reality.